1. Flowable is a set of process and tasks inside it. 3. RuntimeService is a class available to start bpmn process. 4. TaskService is also a class available in flowable to initiate / play / work around with the flowable tasks. 7. How to create a diagram in flowable ? 8. How to configure a Delegate services in Flowable ? 10. How to create Dynamic Tasks in Flowable and Map against particular process ID? 11. How to trigger a particular task or process in asynchronous way ? 12. How to start the flowable BPMN process from your main java class ? 13. How to trigger or set the process variables for a particular process using flowable rest ? Below snippet is only for understanding on how the process and tasks will be created in flowable for any bpmn process. couponupload is process id/key created to upload the coupons for a particular shop. This process will have set of tasks in order to complete the whole process, here totally 2 process, one is store already partnered or not and whether the category already available or not. You have to download flowable-6.4.0(latest while writing this article) and download the apache tomcat, then move all the below five war files to webapps then do tomcat restart for the deployments. Note: Apache tomcat may be asking you to enter username and password for manager-gui/console, for that you have to do the below simple step. Tomcat 7, 8, 9 Default password setting guidelines. 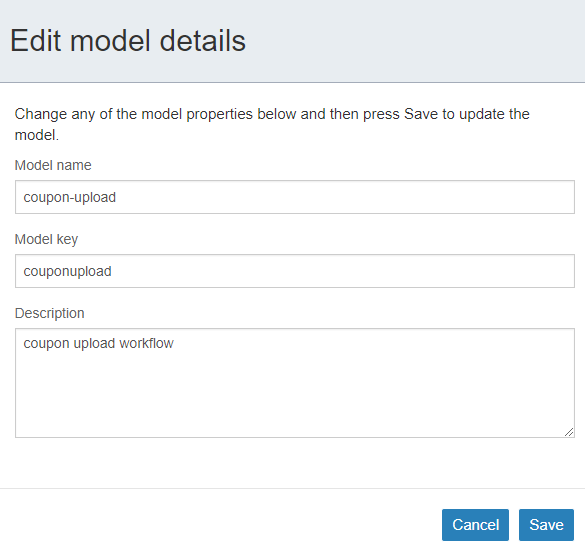 Note: couponupload is the process id mentioned in the xml above(or the Model key as per the flowable diagram created, which looks similar to the below popup), processMeta can be passed to process as maps. // this just fetches the list of tasks by the assignee name. //Here executionid, is the task key id. // this returns the coupons process variables saved. We have different flows like manual task, end event, choice gateway, timer trigger, intermediate events etc. Along with that you will also find a different tasks like user task/Script task/Business rule task/Receive task/Manual task/Mail task/Camel task/Http task/Mule task/Send task/Shell task/Decision task. Mainly we need to fill the fields for every tasks like id(unique to identity and process the task), assignee to take the flow properly with respect to the allowed flowable users, Delegate expression like sending/notifying some updates to involved groups and category(this one can be reused to identify if different flows are using the same functionality). In the flowable, we may require sms/email notifications sometime, this can be configured using JavaDelegate provided in the flowables. This will be triggered when delegate expression enabled in the BPMN processes. // your business goes here. If you want to listen to some task and do some other task then execution listeners are good option in flowable. Here in this case smsListener task will be listened here and executes the notify method, so that if anything else needs to be run in parallel with sms tasks then this can be utilized effectively in flowable. If you like to map this dynamic flowable task agains any process, then before saving / calling .saveTask() method set the process Id Also for the flowable dynamic tasks. When we are doing some synchronous calls and waiting for some kind of asynchronous responses from any external systems, then triggering the task after that async call is really a important stuff to know and work to allow the flowable to flow when we are using flowable BPMN. Here you can consider passing your process instance id and activity id to your synchronous call itself, because these both are mandatory to get the flowable execution object to call trigger method as it internally takes the execution ID. This below main method will load the database from your localhost and tries to load the coupon_publish_workflow.xml bpmn from src/main/resources/flowable-processes folder. And inside the sample xml it has lot of process and subprocesses, we have to give the main process key that is coupon_publish_start in the runtimeservice.startProcessInstanceByKey method to start the BPMN process from your own created xml BPMN. // refer the key in coupon_publish_workflow.xml file. Below is the link which can be used to set the process variable against the particular process definition key. Here admin is username and test is password, which is directly mentioned in the below url and the same can be hit using Postman.